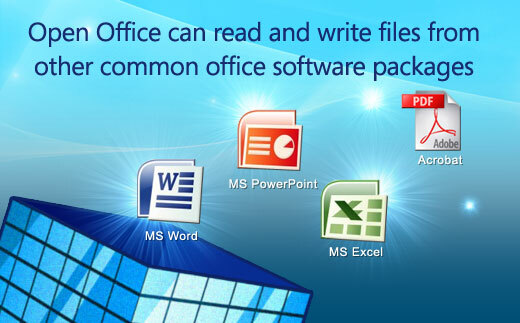 OpenOffice is the leading free office suite software. Why pay hundreds of dollars for Microsoft Office? Save your hard-earned money—OpenOffice is the free alternative! Produce professional documents and Web page. You can even open and edit Word files! Create spreadsheets and charts and analyze data—easy as 1-2-3! Produce top-notch presentations sure to wow your audience. Manage a broad array of data and build forms and reports that make sense. Create 2D and 3D graphics and diagrams with this easy-to-use tool. Format complex math equations and integrate them into documents with ease. Produce professional documents, spreadsheets and presentations with OpenOffice—all without spending a dime! Start saving time and resources with OpenOffice now! Why waste time and money on another office package? OpenOffice is the alternative you've been searching for—and it's free! and save time and resources in a seamless transition. OpenOffice is open source software, saving users hundreds of dollars. OpenOffice users have the freedom to download, modify and distribute the office software–all at no cost! OpenOffice not only creates PDF files, OpenOffice can edit them too! Modify PDF files without costly programs like Adobe Acrobat. OpenOffice builds HTML documents or saves existing documents in HTML. A template wizard also provides endless options!